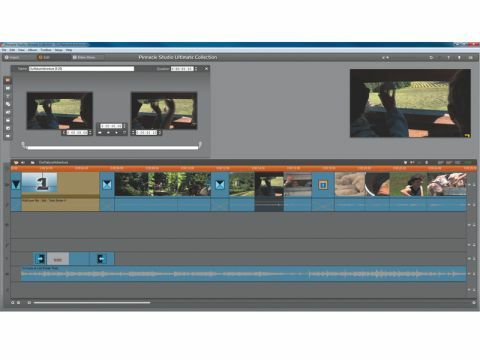 Pinnacle Studio 15 is one of the most complete video editing packages, starting out well by offering a full sample project that lets you really see what you should be building towards. Where most simply offer tutorials and expect you to fill in the gaps, being able to see everything from chroma key to professional-quality cutting in action is a great help if you're new to video editing. What really stands out is the high quality of the effects at your disposal. Montages, for instance, work like super-transitions, letting you import multiple clips into an animation (for instance, a pan over several Polaroids, or three vertical bars of clips that fade in and out, music video style) that look surprisingly good. The dedicated Effects corner offers several impressive tweaks that you can apply to your video, but by far the best is 'Looks'. This offers a range of post-production filters to make your video stand out, from the classic day-to-night effect to faking a tilt-shift and adding a dreamy look to your movie. There are a few minor irritations, including the small size of the preview window, a limited number of tracks, and the fact that while Pinnacle does offer dual-monitor support, it only stretches to letting you make the second monitor a fullscreen preview. The fixed interface doesn't offer any scope for moving things around, and its media organisation tools are weak. However, nothing in this test does a better job of letting you play with the raw look and feel of your clips, making Pinnacle especially worth checking out if your video editing wish list extends to post-production. That does push the price up a bit though, because both the regular Studio 15 and Ultimate editions lack the 'Looks' plug-in and some of the other fancier filters.